To make sauce -Take a pan, add tomato puree, salt, garlic paste, red chilly powder and cook it for 5-6 minutes. Switch off the gas stove. Add grated cheese and mix it well. To make crisps -Take brinjal and make about 1/2 cm thick slices. Take a bowl. Add curd, ginger-garlic paste, green chillies, salt and mix it well. 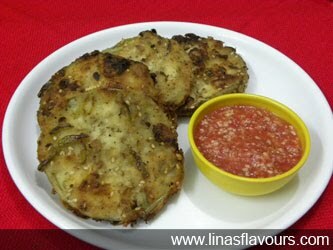 Soak the brinjal slices in this mixture for about 20-25 minutes. If you do not have time then you can soak it till you prepare other things. Take another bowl and combine all dry ingredients. Take a flat pan and add 5-6 teaspoon of oil. Take out the slice from curd, roll into dry mixture and shallow fry on both the sides till it is light brown and crispy. Shallow fry all the slices in batches. Serve it immediately with tomato-cheesy sauce.